!Warning : Unplug from outlet before maintenance. 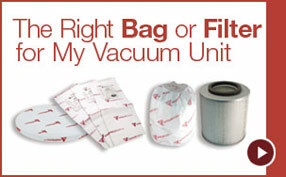 Regular maintenance of the filtration system is recommended to ensure maximum performance of your central vacuum. 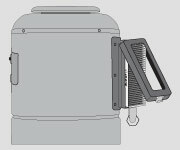 For models of the DL series, the Information Center will indicate when to empty the canister and clean the filters. These indications are provided by an electronic timing board, only as a reference guide. 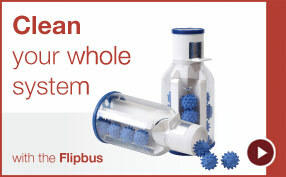 Your central vacuum is equipped with two filters. The anti-clogging filter (thin fabric) stops the larger particles, and the Cyclofiltre (thick fabric) catches the microscopic particles. The Cyclofiltre is equipped with an antimicrobial treatment to prevent the growth of mold, fungus and bacteria. This filter is washable in cold water (no bleach) and can be dried at low temperature. 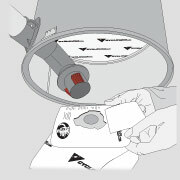 To remove the filters, first remove the dust receptacle. 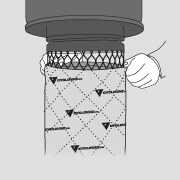 Then, use the straps at the base of the filters to withdraw. 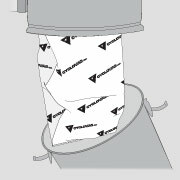 We recommend cleaning the anti-clogging filter (thin fabric) every time the dust receptacle is emptied. You may either shake it out, or rinse it. 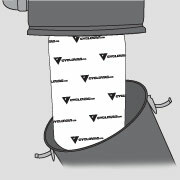 The Cyclofiltre (thick fabric) should be cleaned after four anticlogging filter cleanings, or approximately once a year. 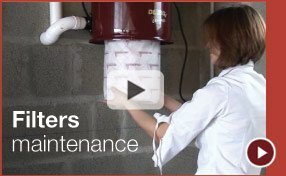 Both filters must be completely dry before they are reinstalled. Carefully install them in the support grooves on the filter frame to ensure adequate protection of the motor. 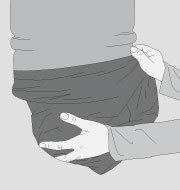 Install the Cyclofiltre (thick fabric) first, and the anticlogging filter (thin fabric) over. 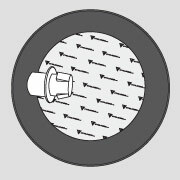 Inspect the filters for tears and punctures before reinstalling them. Do not reinstall damaged filters. Replace the bag when full. Frequency will depend on use of the unit. For the GX series,the DataSync monitor will indicate when to change the bag. These indications are provided by an electronic timing board, only as a reference guide. To access the bag, unlatch the two clips and remove the dust receptacle. Remove the used bag and seal bag opening (adhesive seal provided on each bag). Discard used bag. Install the new bag, ensuring the tabs on the bag adaptor are aligned with the slots in the bag collar. 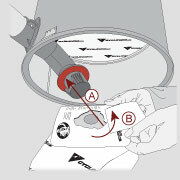 Ensure adequate sealing by inserting bag as far as retention ring (A). 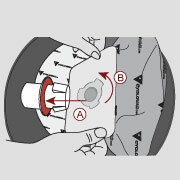 Rotate bag 20° (B) to ensure tabs on bag adaptor are no longer aligned with the slots in the bag collar. Put the dust receptacle back in place and seal by latching both clips. 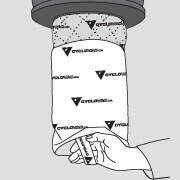 Only use genuine Cyclo Vac replacement bags. 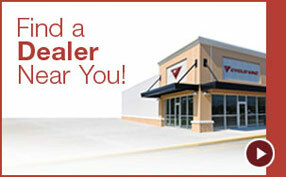 Failure to do so could void the warranty on your vacuum unit. Replace the bag when full. Frequency will depend on the use of the unit. To access bag, remove the power unit top cover. Remove the used bag and seal bag opening (adhesive seal provided on each bag).Discard used bag. Put the top cover back in place. 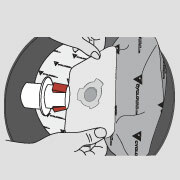 The disc-shaped filter, located between the dust bag and the motor, should be changed after three bags replacement (45 hours of use), or more often, as needed. Unlatch the opening on the carbon filter case and gently lift it upward. Remove the used filter, and discard. Insert the new filter. 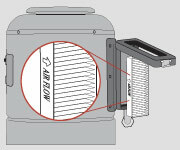 When doing so, ensure that the arrow printed on the filter itself points outwards. Replace the bag when full. Frequency will depend on use of the unit. 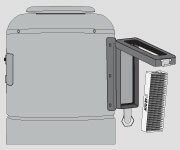 For the HX series, the DataSync monitor will indicate when to change the bag. These indications are provided by an electronic timing board, only as a reference guide.For maintenance instructions, please refer to the section: Disposable bags and filter replacement. 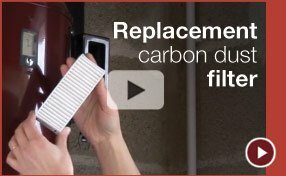 We recommend you empty the dust receptacle and clean the permanent filter at least each season, depending on use of your central vacuum. To empty the dust receptacle: Disconnect the unit from the electric outlet. Unlatch the two clips, remove the receptacle, and empty into an appropriate container. Replace the dust receptacle and seal with the two clips. Reconnect the unit to the electric outlet. Should the filter become stained, or emit an unpleasant odor, it may be washed in cold water (without bleach). Rinse and dry well before replacing. Do not tumble dry. 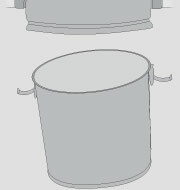 This drum-shaped filter requires no maintenance. It will be checked by the authorized dealer when you have the vacuum power unit inspected, after approximately 500 hours of use.